There are many spiritual cities in India, considered as epicentres for spiritual learning and practices. This summer, “Kashi” , one of the celebrated spiritual city , came to limelight of media, for the great political battle around election 2014. But before that , Kashi was known to be “Shiva ka Nagri” one of the most important spiritual city of learning, encouraging different streams of Spiritual practise. Many people believed that dying in “Kashi” , helps one to get salvation. In contrast, in “Tiruvannamalai” , one of the greatest spiritual cities in the world , people believes, one gets liberation while living, a phenomenon known as “living liberation” in spiritual context. Historically , Tiruvannamalai, has been ruled by many South Indian kings, for nearly 1000 years , who has patroned the Annamalyair Temple, latest being Tipu Sultan, who has ruled the city from 1750-1799 , before it come under British Empire, and finally become one of the important Temple town in Indian Republic, alongwith a important Shaivate pilgrimage in the state of Tamilnadu, associated with the fire element. 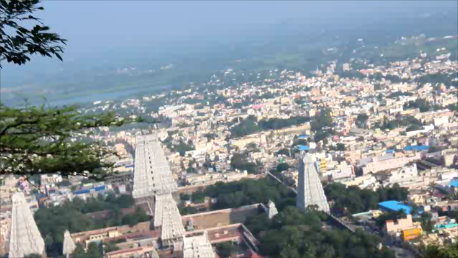 Mt Arunachala which has height of 2,669 ft (814m), revealed himself as Swayambhu lingam to Maharishi Gautama, when Gautama wanted to know about the ways of worshipping Arunachala. Even today, in the Girivalam path, which was the main circular road in the Tiruvannamalai city , there were places like Nandimukha, where one could get the vision of Swayambhu lingam, with Bhagavan Nandi sitting in the front of the Syambhu lingam, which was shown to Maharishi Gautama. In July,2012, when Sri Joydip Ashram conducted its first Guru Poornima Retreat in Tiruvannamalai , while circumbating the hill with the participants of the Guru Poornima Retreat, I also came to see for the first time , the Ganesha mukha, a little ahead of the old Annamalyair Temple and before “Ramana culvert” [ Named after Ramana Maharishi, who use to sit down on that Culvert, and meditate in silence, on Arunachala for long period, whenever he use to go for circumbating the hill,with his disciples ] , where the Mt Arunachala exactly look like Lord Ganesha. [ Thank you all who have registered in Guru Poornima Retreat 2014, on “Arunachala Siva – The Ultimate Sadhana” . Though the Premium registration is full and not available for this year any more.Those who have not registered still now, can hurry up and avail the Residential Registration for Rs 16,000 and Non Residential Registration for Rs 14,000 which also is available in limited numbers from 9-12th July.Those interested can mail to sscexams.srijoydipashram@gmail.com .